Alex Kurtzman makes his directorial debut with People Like Us – a drama written by himself, along with long time collaborator Roberto Orci and newcomer Jody Lambert. Normally when the names Kurtzman and Orci are mentioned, one assumes sci-fi or fantasy. After all, they’ve made a name for themselves as frequent collaborators of JJ Abrams and Michael Bay after getting their start writing for Hercules and Xena. People Like Us, however, is as far from those genres as can be – it was actually inspired by the true events of Kurtzman’s life, as well as having elements of Orci’s and Lamberts experiences mixed in. The story – which revolves around a young man who suddenly finds he has a sister he didn’t know – may be outside the writers’ normal zone, but the cast is a bit of a reunion for them. Chris Pine from their Star Trek reboot stars, and Olivia Wilde and Jon Favreau of Cowboys and Aliens appear as well. The in-demand Elizabeth Banks, Michelle Pfeiffer, and relative new comer Michael Hall D’Addario fill out the main cast. Supporting characters include the up-and-coming Mark Duplass and the ever present Philip Baker Hall. Sam (Pine) is a businessman buried under debt and under investigation by the FTC. To make matters worse, his estranged father dies in the middle of it all. Reluctantly he heads off to the funeral with his girlfriend (Wilde). While staying in town with his mother (Pfeiffer) he gets a call from the family lawyer (Hall). It turns out his father (Dean Chekvala) had left him something – $150,000. The catch is, he’s only the messenger. The money is supposed to go to his sister and her son – a sister he never knew he had. He’s soon on a whirlwind tour of his recovering alcoholic sibling Frankie (Banks) and troubled nephew Josh’s (D’Adarrio) lives. Getting to know the two, he tries to decide how, and if, he should tell them who he really is and that he has 150 grand to give away to them. What’s in the bag, Chris? This is essentially a love story, albeit not a romantic one. The chemistry between Sam and Frankie makes for some awkward moments for the audience, though the payoff in the end makes it all worth it. The story itself is a little weak and a little soapy, but Pine and Banks show incredible acting here, keeping it very real and very strong. It’s intelligent and touching, if a little dry in parts. Elizabeth Banks, who is more often associated with comedy and camp than drama, establishes herself as a more than capable leading lady. 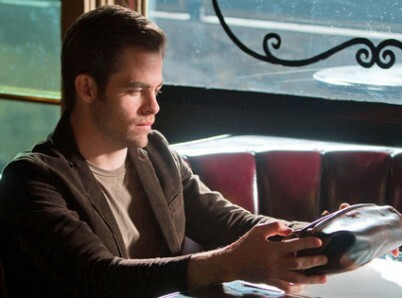 Chris Pine does his best to encourage audience amnesia when it comes to his recent dud This Means War, exuding real talent here with the layered character of a damaged son. It should go without saying that Pfeiffer’s portrayal of Sam’s mother is excellent as well. Because of the atypical subject of sibling love and family drama coming from names more associated with aliens and explosions, the mainstream audience could easily overlook this film. I hope not though, because it is certainly worth seeing. It’s a little different, a little awkward, and a little slow paced, but if you give it a chance, I think you’ll enjoy it. People Like Us arrives in theaters this Friday. This entry was posted in Reviews, The MG Blog and tagged alex kurtzman, chris pine, elizabeth banks, people like us by HamiltonW. Bookmark the permalink. I graduated from York College of PA in 2008 with a degree in professional writing and minors in creative writing and visual communications. I enjoy photography, working with my hands, and films of all sorts including, of course, The Hunger Games. Currently I am the Webmaster and Marketing Director for The Gary Rosenthal Collection as well as editor for MyHungerGames.com. I live in Maryland, not too far from DC with my wife and cat.